Chenopodiaceae - goosefoot family Dicot. This exceedingly prickly plant has special adaptations allowing it to tolerate a hot, dry, high salt environment. 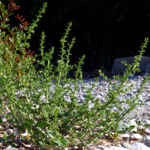 Early in the year there is no sign of the plants but by September, Salsola kali, is abundant on the sandy beaches of Skopelos. It is an annual which grows quickly from seed. As the flowers are wind pollinated, they do not need to attract insects and are very inconspicuous, but close inspection reveals the pale yellow or, occasionally, pink anther which in each flower precede the female stigmas, which are fine, translucent white filaments. The developing fruits are surrounded by papery bracts. The shallow rooted plants are prone to form tumbleweed in winter. When burnt, the plants produce an ash which is rich in potassium salts; this was used as flux in glass production in ancient Mesopotamia, a practice which continued till medieval times.